Trigger Finger and Trigger Thumb are common examples of tenosynovitis, inflammation of tendons of the hand and wrist. Tendons and pulleys, thickened area of the sheath, help your fingers and thumbs bend. Normally, the flexor tendons easily fit through the sheath in each finger and pass back and forth without difficulty as the finger bends and straightens. When the flexor tendons of a finger or thumb become swollen (tenosynovitis) they get stuck in the tube-like sheath around them. If the tendons become swollen, the sheath cannot accommodate them. Consequently, as the tendons try to move in and out of the sheath they become stuck and may pop through, leading to triggering. Trigger finger demonstration, clinical location of pain in most cases. Mild discomfort at the base of your finger or thumb, where the joints meet your palm, may be the start of trigger finger. You may also notice increased sensitivity in this in area along with a small lump which is the inflamed tenosynovium. Pain with moving the finger. Sometimes there may be triggering, but with minimal pain. Tendons have become so swollen and the sheath so tight that the tendons cannot even pass all the way through. Limited range of motion of the finger without actually triggering. 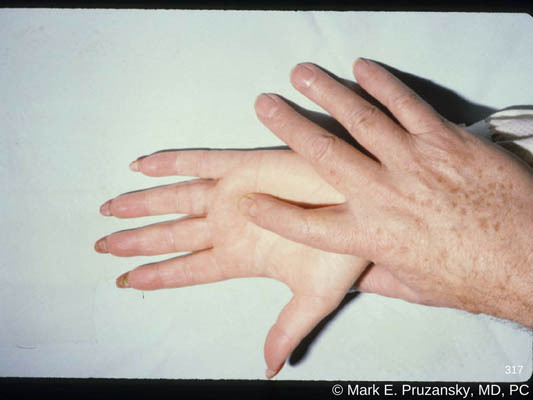 Trigger Finger most commonly occurs due to a genetic predisposition. Other causes may include injury as well as diseases like Diabetes, Hypothyroidism, Gout, and Rheumatoid Arthritis. The examination is as simple as speaking with you to understand your symptoms, your daily activities, and carefully examining your hand. If an x-ray of the hand is performed, it is used to evaluate or eliminate other reasons that may be causing you to experience pain and stiffness. Persistent cases that do not respond to steroid injections may benefit from trigger finger or trigger thumb surgery. The procedure is minimally invasive and involves opening part of the sheath, so that the flexor tendons have more room to move. First, the clicking or popping generally goes away. Increased finger motion generally returns quickly. Physical therapy, called occupational therapy, for the hand may be needed to optimize recovery. Trigger Finger and Thumb are common and can range from being a mild nuisance to causing great difficulty with use of your hand. Call HandSport Surgery Institute at 212-249-8700 to schedule an appointment and begin the process to improve pain and mobility.